Albion locomotive is another British-made locomotive brought to Stellarton (then Albion Mines) by the General Mining Association. The identity of the builder is not clear. It has a plate on the front that says, “Rayne & Burn Engineers Newcastle Upon Tyne 1854”. It had been thought at one time that it might have been made by Timothy Hackworth like Samson, but experts have determined it to be “School of Hackworth”. The first thing one might notice about Albion is its unusual angled cylinders, positioned high on the boiler barrel and inclined thirty degrees downward to drive the centre set of wheels. From 1830 most locomotives had horizontal cylinders. Hackworth is known to have continued using angled cylinders until 1845 although connected to the rear instead of the center wheels. Despite the date plate now carried by Albion, it is difficult to determine when it was built. Over the years there have been many different dates given and it is not known if the plate has always been on it. It might even have been added in the twentieth century. Photos from when Albion was exhibited in 1893 show it without the plate. Other accounts record memories of Albion’s arrival in 1854 and that it was made by Rayne & Burn, a company that may never have made any locomotives at all. This shows how history can get muddled in a swirl of myth and half-remembered stories when written records are lost. 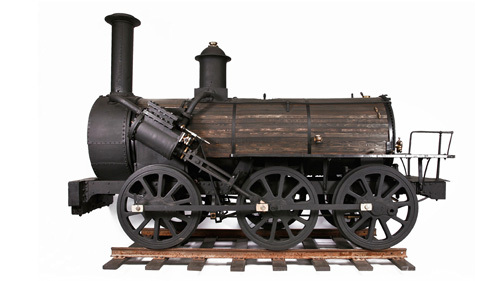 Experts consulted by the Museum concluded that: Albion was likely built as a contractor’s locomotive between 1849 and 1854. It may have been built by Fossick & Hackworth (George Fossick and Thomas Hackworth, Timothy’s brother) or by another manufacturer working to similar specifications. Together with its sister locomotive Pictou, it may have been available as a surplus locomotive arising from a frustrated order, or alternatively it may have worked for a time in Britain before being refurbished by Coulthards or another, and exported in 1854 by Rayne & Burn. Little is known of Rayne & Burn. They did supply equipment to the General Mining Association. They may have built one or two locomotives but the records are not clear. Another locomotive attributed to them may have been built by Fossick & Hackworth. Rayne & Burn may have just been waggon builders and suppliers of mining equipment. We do know that Albion spent the next 30 years hauling coal on the Albion Railway to the loading ground at Pictou Harbour and retired from active service in 1886 when the line was closed. In 1893 it was exhibited in Chicago with Samson. Both locomotives were acquired by the Baltimore & Ohio Railway Museum and put on display there until they were returned to Nova Scotia in 1927. In 1950 they returned to Pictou County. Albion was displayed in Stellarton and Samson in New Glasgow. Cylinders: 14 3/8" bore, 181/2" stroke, inclined at 30 degrees.